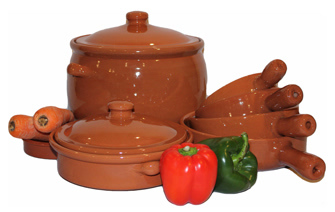 ABS Pottery Imports Limited - Specilist Supplier to the Trade of Authentic Terracotta Cookware & Kitchen Accessories. To See Our Full Range of Products and Prices Download the Product Catalogue & Price List Below. 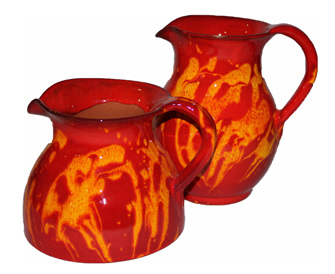 ABS Pottery Imports has specialised in the distribution of Terracotta Products for nearly 30 years, they are natural products made from clay and are quite unique. For example Emilio's Cookware is manufactured and fired in a way that enables it to be used directly over a gas flame or on an electric hob, it can be used in all types of oven, is ideal for microwaves and is brilliant on BBQs. All of the products are dishwasher safe and virtually non-stick, you just soak them in hot water and they wipe clean. For more information check out our care intructions below. Please click here if you would like to view / download our Terracotta Care Instructions PDF. Please click here if you would like to view / download our Terracotta Chicken Brick Care Instructions PDF. For personal shoppers click here to visit our ecommerce website. Our Traditional Brown Terracotta has always been a staple part of our company’s product line. It is a best selling range due to its high quality finish resulting in excellent resilience. We also stock a condensed version of our Traditional Brown Terracotta in a ‘Rock Hard’ finish which has been specifically designed for the catering industry. The terracotta has been fired at a higher temperature meaning that the products are more resilient to temperature and general wear and tear. All products are safe for use with dishwashers, microwaves, ovens, gas and electric hobs, Agas, barbeques, and freezers. All products are virtually non-stick. 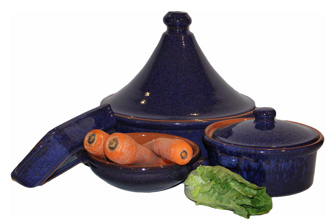 The glaze has a beautiful two-tone effect of a dark and a lighter blue. We are very positive about the selling potential of this range, having already received very positive feedback. All products are safe for use with dishwashers, microwaves, ovens, gas and electric hobs, Agas, barbeques, and freezers. All products are virtually non-stick. Another of the very nice reactive colour ranges. All products are safe for use with dishwashers, microwaves, ovens, gas and electric hobs, Agas, barbeques, and freezers. All products are virtually non-stick. 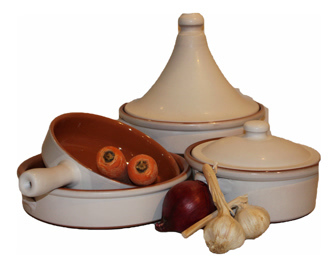 An Exclusive Range of Terracotta Cookware with a contemporary feel and durable matt white glaze to "mix and match" with our other colours and suit any kitchen. A contemporary range of two-tone dishes, incorporating vibrant colours set off beautifully by the matt black exterior. The colour choices are Black/Red and Black/Green. The Chicken Brick allows chicken and other joints of meat to cook in their own juices ensuring succulent and tasty results, whilst still browning the food! Not only for cooking meat joints, the Chicken Brick can also be used for fish dishes, curries, casseroles and vegetables amongst a variety of other meals. Please click here to view our Chicken Brick Recipe. 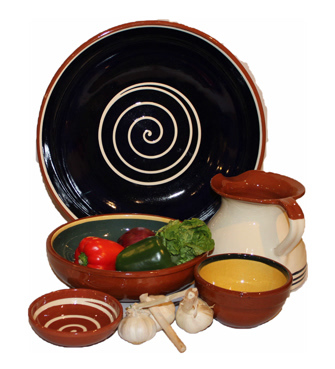 We have supplied our Swirly Manoli bowls for nearly as long as we have been a company and they have always been a best seller. They are eye-catching, bright and look stunning at any table. The design has been altered from the original and now has a reduced swirl on the inside of the bowl. This enables the striking colours that already exist in this range to stand out far more. All products are dishwasher safe. A popular seller, our Splashy bowls are ideal for serving salads and vegetables, as a fruit bowl, or even just as an attractive display piece on your coffee table. We sell the bowls in two sizes: 20cm and 25cm. They come in four different colour ways: Yellow, Green, Blue, and Cream. All products are dishwasher safe. Due to its immense popularity we have extended the range to include Olive Dishes, Shallow Tapas Bowls, Chubby Jugs and Rectangular Platters. They are eye-catching, bright and look stunning at any table. A bold, vibrant design incorporating our existing cream base with a unique "splatter" pattern in four colours of glaze - Dark Blue, Dark Green, Red and Blue (introduced in 2017) and Teal, a brand new addition for Spring 2018. Our Speckle bowls are ideal for serving pasta dishes and risottos. They come in three sizes: 20cm, 25cm and 29cm. The bowls come in two different colour ways: Red with Green or Red with Yellow. All products are dishwasher safe. 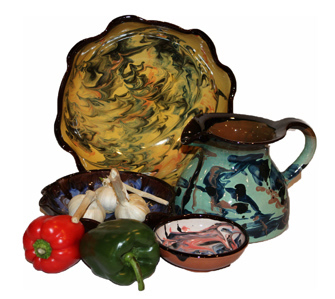 We have introduced our traditional and chubby jugs and a full selection of bowls and platters into this increasingly popular range. 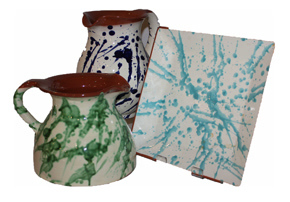 These products have an eye-catching glaze in either Green or Red with a black edging. The colours compliment each other when presented together but are just as striking individually. They are ideal for serving pasta dishes, risottos and salads. The bowls come in two sizes: 20cm and 25cm. 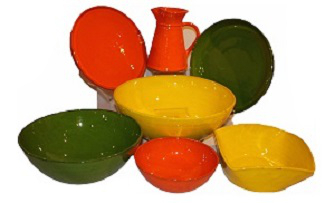 Introduced in 2017, a brand new range of Dolores Serveware in vibrant colours of Tangerine, Yellow and Green. It comprises three sizes of Deep Bowl, a 28cm Shallow Bowl, a Square Deep Bowl together with three Traditional round Platters and two Rectangular Platters, and a beautifully shaped Tall Jug. 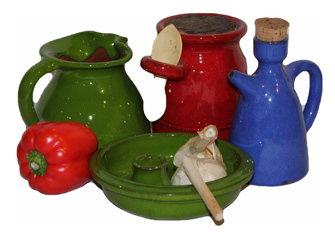 Our colourful kitchen accessories are eye-catching in any kitchen and at any table. The products are attractive when presented as individual colours or mixed. All products come in 3 different colours: Red, Green and Blue. All kitchen accessories are dishwasher safe. 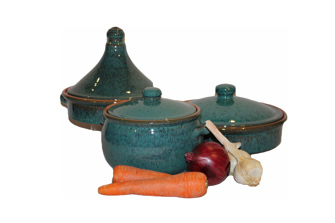 ABS Pottery Imports Limited have specialised in supplying Terracotta to the Trade for nearly 30 years. During this time we have pursued a policy of continuous improvement with our Suppliers and we now have the greatest of confidence in our Products to be able to offer a Guarantee against defects in Quality & Performance.The Guarantee will be for a period of 5 years during which time we will replace any product found to be defective provided that it has been used in a normal manner and in accordance with the Care Instructions provided. This guarantee does not affect your normal statutory rights. If you find any of our products currently being sold by us at a better price elsewhere, and in stock with that supplier, we will match that price with the same products from our range. If you wish to take advantage of "price matching" simply call the office on 01789 490613, give us details of what is on offer, and we will do the rest. Reproduction in whole or in part in any form or medium without express written permission of ABS Pottery, is prohibited. Copyright © 2012. ABS Pottery. All rights reserved.